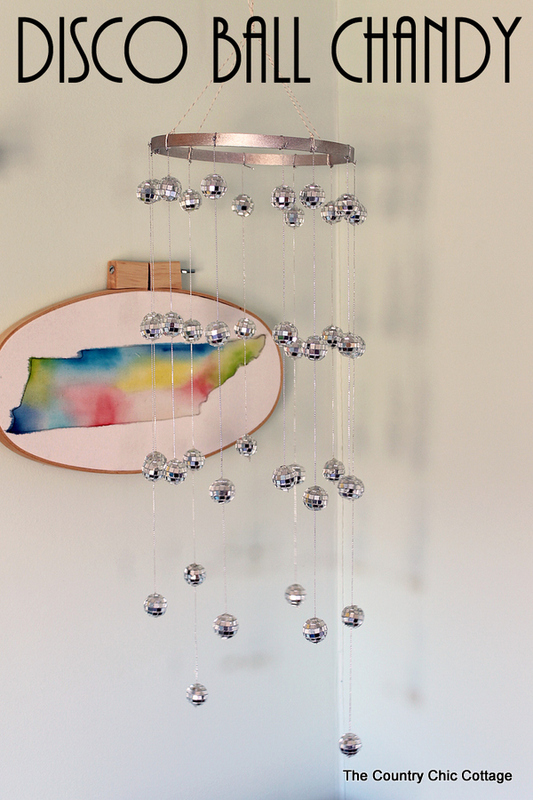 Sometimes you just have to make your own disco ball chandelier. Life just calls for one. A room screams for one. Surely I am not the only one that has felt this way. 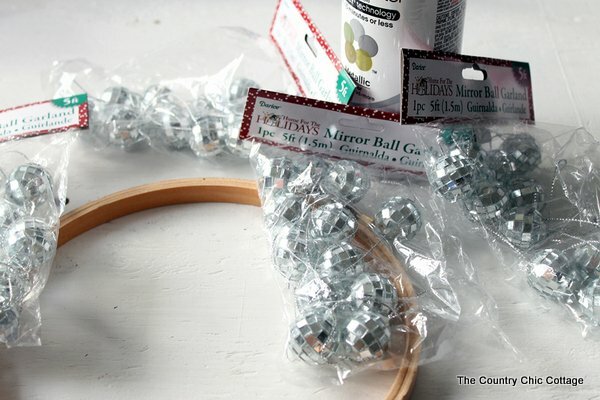 If you love those mini mirrored balls, you will love this craft project. It is perfect for a teen room but also if you just want a little sparkle in any room of your home. This one was originally posted over at Crafts Unleashed where I am a member of the design team but I thought I would post it here in case y’all missed it. Separate the embroidery hoop into two pieces. We are just going to use the inner hoop without the screw for this project. Paint it silver and allow to dry completely before continuing. 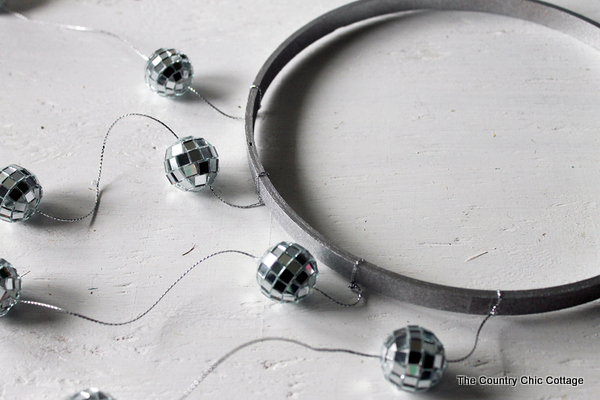 After it is dry, it is just a matter of tying on strands of the disco ball garland. I just cut off a portion (leaving a long string as shown on the right below). 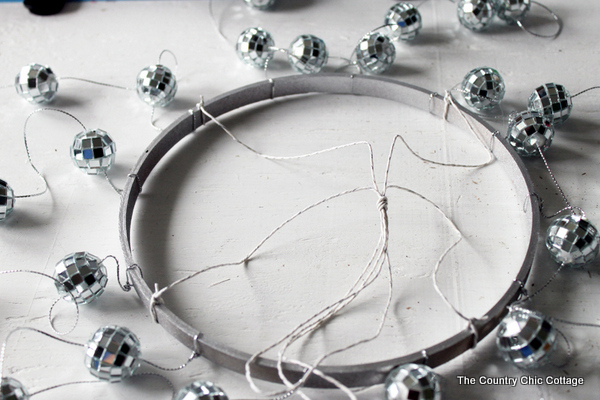 Then tie it onto the hoop and trim any excess with scissors. 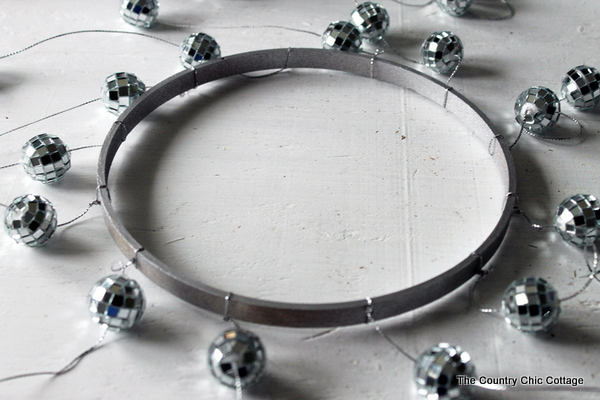 I wanted a staggered look so I cut the disco ball garland into various lengths from 3 balls to 5. Tie them at approximately even intervals around the hoop. You could make all of your strands the same length as well. Continue all the way around the hoop. I used all of the four garlands I had except for the one extra ball per strand that you will be left with. The one extra on the end does not have an open string to tie onto the hoop. 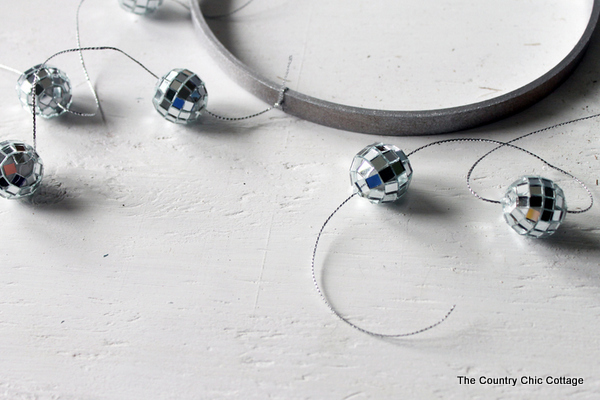 If your strands are not evenly spaced, just push them around the hoop to fix. Tie on the kite string as shown in the image below. I tied two strands across the hoop and then gathered them at the top to knot. The top knot is what I will use to hang the disco ball chandelier by in the room. I held the entire thing up off of the table while tying this last part to make sure it was going to hang evenly. 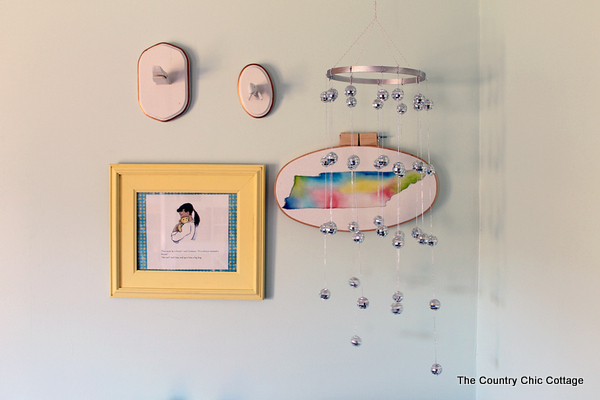 Hang your disco ball chandelier from a hook in your ceiling and this one is ready for display. I know of a few teen girls that would love this in their room! 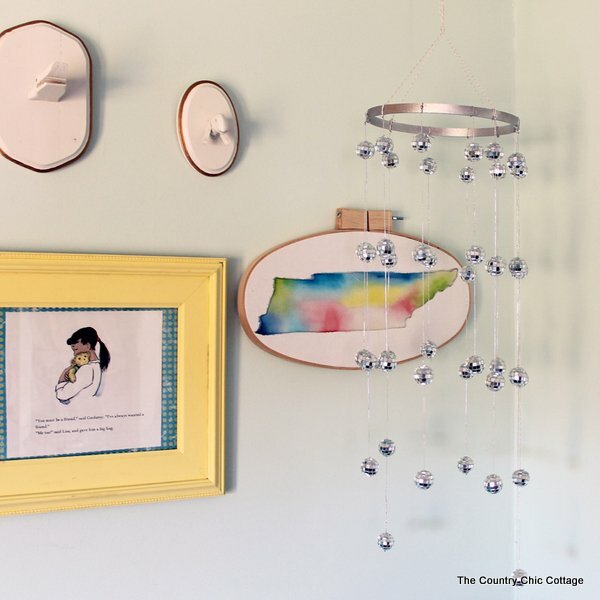 Try to make your own disco ball chandelier today! You will love the results! Love the other items pictured here? Be sure to click here to see how to make our faux animal heads or click here to see how to make that watercolor state art. What a cool idea! My girls would have loved this when they were younger.